Gateway Market Center is a commercial development located at the intersection of U.S. Route 29 and U.S. Route 33 in Greene County. 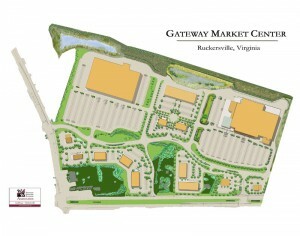 This commercial development consist of 65 acres and has WalMart and Lowes as big box anchors. Additional outparcels are under development. WW Associates prepared the site development plans for this development as well as utility and roadway improvements. An interior 3-lane VDOT road provides access to the 7 interior parcels. Stormwater management consist of a complex series of water quality features, biofilters, and stormwater management ponds with integral biofilters, A wetland area was preserved interior to the commercial development with regulatory oversite.